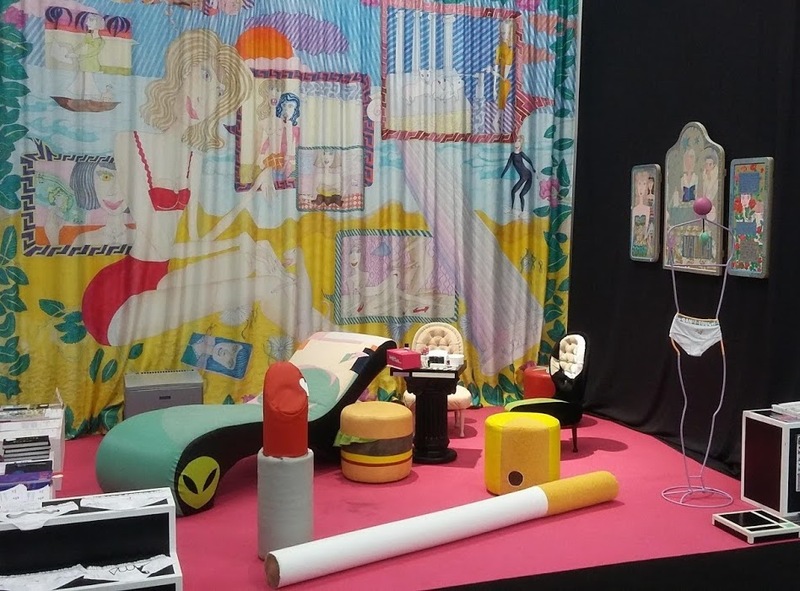 The main element of the stand will be a silk curtain, Animal Testing (2017), designed by Magdalena Kita accompanied by a selection of feminist-byzantine icons from the series Absolut Vanilla (2017–2019). The performance will create a setting for intimate conversations about the relations between the sexes in our society. The ritual of painting nails initiated by the artist will create a physical connection between the participants and an opportunity to go beyond the usual art fair smalltalk. The performance is open for everyone, not only those who are female identifying. “Sticks and stones may break my bones, but words will never hurt me” is an old adage that teaches children to minimize the damage caused by verbal abuse. This underestimation of the power of words leads to a lack of recognition of the healing potential of words. (Let alone the healing unleashed in the building of an entire narrative!). Narrative Exposure Therapy (NET) uses the symbols of sticks and stones to represent events in which we have hurt others and been hurt ourselves. NET is an empirically supported short-term approach to addressing trauma spectrum disorder for survivors of singular, multiple, and complex trauma. Because we are generations deep into no longer knowing how to harness the power of the narrative, concrete symbols, such as sticks and stones, will guide us back to being able to describe our observations and assumptions about men and women and our experiences with the relationship between the two. This contribution will be an offer of support in finding the words needed to facilitate a discussion about the hurt and those who inflict hurt. Magdalena Kita studied at the Kunstakademie Düsseldorf, in the classes of Rita McBride, Tal R, and Herbert Brandl. Earlier, she attended the Kunsthochschule Kassel and studied painting at the Academy of Fine Arts in Kraków. She lives in Cologne. Kita received a 2017 project grant in Los Angeles from Ministerium für Familie, Kinder, Jugend, Kultur und Sport NRW, was a resident in spring 2016 at Superdeals, Brussels, in addition to a research residency in Athens. In 2016 she won the Van Bommel Van Dam Prize and received a project grant from Kunstsiftung NRW. In 2010, she earned the Nam June Paik Newcomers’ Award from Kunstsiftung NRW. Between 2006 and 2012, she was a founding member of the Congress, a female performance collective. Dr. Danie Meyer has a PhD in Clinical Psychology (University of Konstanz, Germany) and M.Sc. in Mental Health Counseling (Georgia State University, USA). She specializes in Trauma and Aggression, offering Narrative Exposure Therapy (NET) as an intervention to support individuals suffering from posttraumatic stress disorder. She coordinated the European Research Council’s Advanced Grant supported 5-year project entitled “Memories of Trauma and Violence (MemoTV) which investigated the epigenetics of transgenerational trauma in Burundi, Brazil, Germany and South Africa. For nearly a decade, Danie has supported others in wording and structuring the narratives around their lives to address and heal from systemic and interpersonal violence. And She Was Like: BÄM! is an active network for women in the Rheinland. Started by women working in art and design, And She Was Like: BÄM! is an initiative for women regardless of age, race or social background. And She Was Like: BÄM! stands for a contemporary, intersectional feminism, one that is not dogmatic, and celebrates diversity, solidarity and bridges the gap between genders and generations. We want to end discrimination and oppression and provide equal rights and opportunities. We consider our differences not as a hindrance, but rather as a powerful tool to create a future of equality and respect for all people. We can only achieve this when we all fight for it together.